Acne is one of the misfortunes of adolescence. 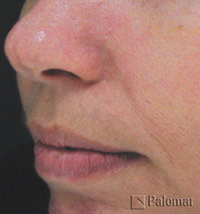 For some people skin blemishes occur in adult life as well. Acne is a skin condition that occurs when the oil-secreting glands in the skin are clogged and become inflamed or infected. LustrePro Pure Light is the new Acne light treatment available at The DermaClinic Blackrock Dublin. LustrePro Pure light Acne treatment is developed by leading dermatologists and tested by healthcare professionals. While not life threatening, acne can leave life-long emotional and physical scars — a reminder of the embarrassment and self-consciousness that came with the pimples. No one wants to get zits. Approximately 90% of all adolescents and 25% of all adults experience acne at some point in their lives. It's one of the most extensive medical conditions in the world, and is responsible for about 30% of all visits to the dermatologists. Unfortunately, it's not easy to treat. Traditional therapies have a variety of side effects and sometimes require months to work, if they work at all. Oral antibiotics can cause stomach upset, light sensitivity and yeast infections in women, and studies indicate about 40% of skin bacteria have become resistant to antibiotics, making them a doubtful ally in the fight against skin breakouts. Acne is a common, chronic skin condition caused by inflammation of oil-producing sebaceous glands. 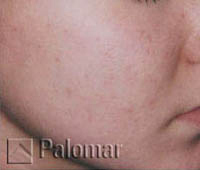 Acne usually begins between the ages of ten and thirteen, and persists for five to ten years. Acne breakouts are most common on the face, but they can also occur on the back, shoulders, neck, chest, scalp, upper arms and legs. Young men and women get acne in equal numbers. Younger males are more prone to severe, longer-lasting forms of the skin condition. Many women suffer from "hormonal acne" — their outbreaks are tied to the hormonal changes related to their menstrual cycle. 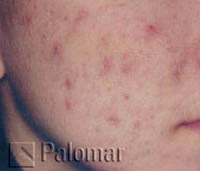 While hormonal acne typically starts between the ages of 20-25, it can strike teenagers as well. 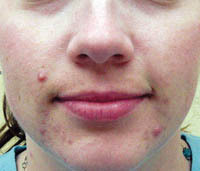 Hormonal acne is sometimes persistent in women in their 30s and 40s. Blackheads and whiteheads, also known as comedones; comedones are enlarged pores filled with sebum. Blackheads are comedones that have opened onto the skin surface. Whiteheads are comedones that are closed on the surface. Pimples, also known as pustules; these inflamed follicles occur when the P. acne's bacteria in the follicle attracts infection-fighting cells. The follicle may rupture, spilling its contents into the surrounding skin, causing further inflammation. Nodules and cysts, which are more severe forms of acne that go deeper into the skin, forming firm, deep bumps and swellings; similar to pimples, they result from increased sebum production, which leads to bacterial growth, irritation and redness. 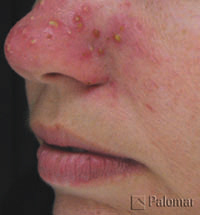 When left untreated, or when "picked at," acne lesions can lead to permanent scarring. We offer a free consultation where detailed clinical assessment may be carried out to prescribe the appropriate treatment. Glycolic acid is what is known as an "alpha hydroxy acid". Alpha hydroxy acids or "AHAs" are a family of acids that occur naturally in various fruits and foods. Glycolic acid, found in sugar cane, is the AHA that has received the most attention medically because of all the AHAs, it has the smallest molecule. This small molecular weight enables glycolic acid to penetrate more effectively and to ultimately bring about the most dramatic and beneficial changes of all the AHAs, often collectively referred to as fruit acids. Among other things, glycolic acid loosens the "glue-like" attachments, or cellular cement, that are characteristic of skin conditions such as acne. This non-invasive lifting of the cells in the stratum corneum enables glycolic acid to act as a phenomenal resurfacing agent that can immensely improve the appearance of the skin. 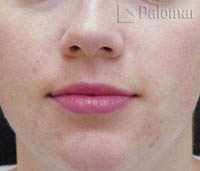 It has even proven to be a valuable tool in reducing the depth of acne scarring. Benzoyl peroxide is a potent and effective therapy for treating acne. It is currently recognized by the American Academy of Dermatology as being one of the most effective antibacterial agents proven to significantly reduce the presence of P acne bacteria (the bacteria believed to play a primary role in the inflammatory aspect of the acne process).P acne bacteria thrives in an oxygen free environment and feeds on trapped oil in the sebaceous follicle. It then releases a toxic, corrosive, fatty acid by-product that works to break down the follicle walls and encourage the leaks and ruptures that produce acne lesions. By reducing the P acne bacteria colonies, the inflammatory process is minimized and clearing of acne lesions is greatly enhanced. An effective new light-based therapy is now revolutionizing the treatment of acne. The ClearLight Acne PhotoClearing TM system destroys the most common bacteria that cause acne - without drugs, without pain and without downtime. The ClearLight system is the first medical device to receive FDA clearance to market for the treatment of acne. 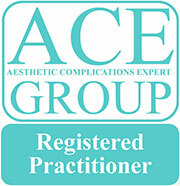 There is a new paradigm for the treatment of acne. It involves a short treatment regimen with impressive results and no side effects, pain or downtime. 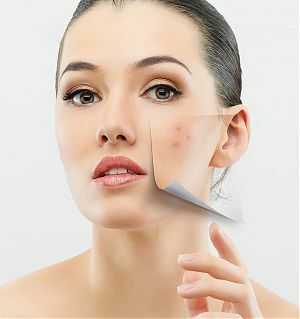 ClearLight uses Acne PhotoClearing TM technology to destroy acne-causing bacteria within the skin. Applied in eight treatments over a four week period, most patients see a dramatic decrease in the number and severity of acne lesions; some report significant improvements after only two or three sessions. 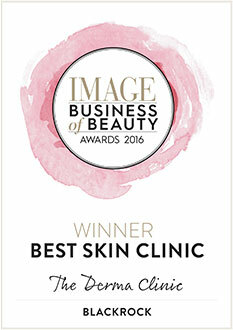 See Acne Therapy Page for more information on Clearlight. 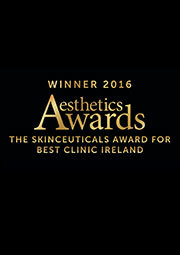 LustrePro Light is the new Acne light treatment available at the DermaClinic Blackrock Dublin. Scientists have found that visible blue light at a wavelength of 420 nm is effective in killing P. acnes, the bacteria which causes acne. 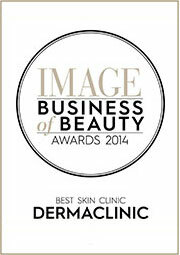 The DermaClinic has used Blue light for many years to treat acne. this home care kit Lustre Light is the latest in Acne treatment. Lustre Pure Light treatment harnesses the safe, blue part of the natural light spectrum and the technology has been clinically proven to eliminate the bacteria that cause spots while also being gentle on the skin. Lustre Pure Light emits light at 420nm and does not contain any of the ultraviolet light, which can damage skin. Scientists have discovered that the spot causing bacteria, P. acnes produce a normally harmless chemical called Porphyrin. Clinical trials have proven that when safe natural visible blue light at 420 nm is shone onto the skin there is no harm to the skin itself, but the Porphyrins produced by the spot causing bacteria become excited. Phototherapy with blue (415nm) and red (660 nm) light in the treatment of acne vulgaris. Papageorgiou et al British Journal of Dermatology 2000; 142:973-978.